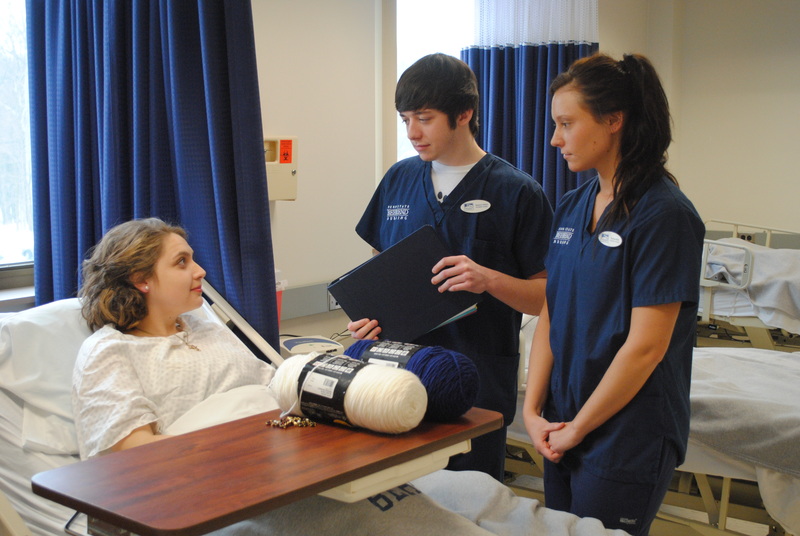 Brenna Lanager played the role of an elderly patient this past fall in a NURS 112 class. Students Hunter Olsen and Nerissa Rich were tasked with trying to prepare Lanager for surgery as part of the simulation. When Margaret Kertis, a lecturer in nursing at Penn State Erie, The Behrend College, pulled back the curtain that hung over the bed where a mannequin would normally lie, students in her NURS 112 course were quickly taken aback. The mannequin that they had grown accustomed to was no longer there. In its place laid a young woman, but if not for her soft complexion and inherent youth, you might think otherwise. Her clothing looked to be something straight out of a Laura Ingalls Wilder novel. Her hair was dabbled in talcum powder. Her hands clenched a rosary. “Their faces were priceless when they pulled the curtain back and saw that there was a person there,” said Brenna Lanager, a sophomore psychology major who happened to be the woman lying in the bed. Lanager’s role that day was as a patient actor. As the students soon learned, preparing an elderly patient for surgery is easier said than done. Lanager, who has previous acting experience from a theater course she took at Behrend, was not exactly the model patient. For the students, the interaction with Lanager was invaluable. “You get real emotions. Yes, they’re acting, but they’re still a real person, and it’s still person-to-person contact,” said Hunter Olsen, a sophomore nursing major who was part of the NURS 112 class. For her part in the course, Lanager earned extra credit points as part of her THEATER 102 course. It also was an eye-opener for the Hawk Run native: her mother works as a nurse. In the future, Kertis said she hopes to again utilize patient actors. Lanager is also eager to volunteer her services one more time. This entry was posted in Around campus, School of Science, Student News and tagged Behrend, Brenna Lanager, Hunter Olsen, Margaret Kertis, Nerissa Rich, Nursing, Penn State Erie. Bookmark the permalink.